Route 66 Summerfest will take place on Central Ave. between Carlisle Boulevard and Girard Boulevard, and Monte Vista Boulevard. 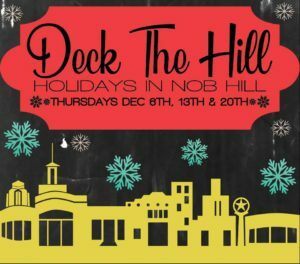 This free event features fun for the whole family including the Route 66 Car Show, Mother Road Art Market, Kids' Zone, food trucks and live entertainment on three stages throughout Nob Hill. Know where you're going and have a complete band schedule by downloading the RT66 Summerfest 2017 Map and Schedule Brochure. Visit abqpride.com/pridefest for more details on the 2nd largest parade in New Mexico that runs straight through the heart of Nob Hill! 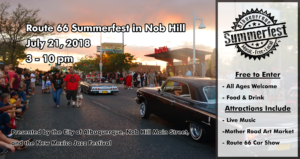 It’s time for Albuquerque’s most dazzling celebration, and it's coming to Nob Hill! This free family-friendly holiday event will bring the sparkle, the glimmer and the twinkle with dancing elves, prancing horses, snowmen and, of course, Jolly Ol' St. Nick. Visit the event's page to find out more about this exciting event. We'll see you there!